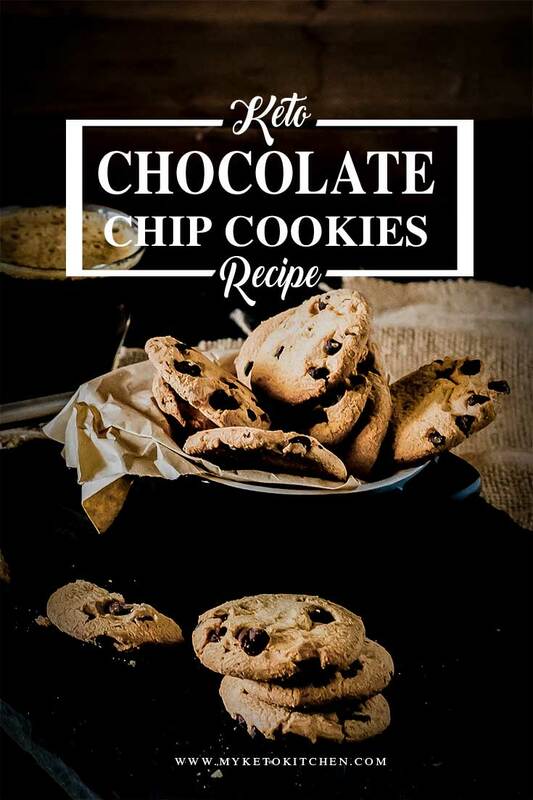 Delicious keto chocolate chip cookies recipe. Keto Chocolate Chip Cookies are low carb, gluten free and totally delicious. They are a great snack to keep at your desk or drawer for when hunger strikes. After our Low Carb Peanut Butter Cookies had been such a success we thought we’d try our hand at other variations. So naturally, keto chocolate chip cookies had to be next. Preheat your oven to 190C/375F. Put all ingredients into your kitchen aid/food mixer and mix all ingredients on a low setting until all ingredients mixed together. If you don’t have a kitchen aid/food mixer you can get one here. Roll into 12 tablespoon-sized balls and press onto a lined baking tray. These cookies have minimal spreading so they can be placed relatively close together. Bake keto chocolate chip cookies for 14-19 minutes. The cookies are ready when they feel a little firm around the edges. 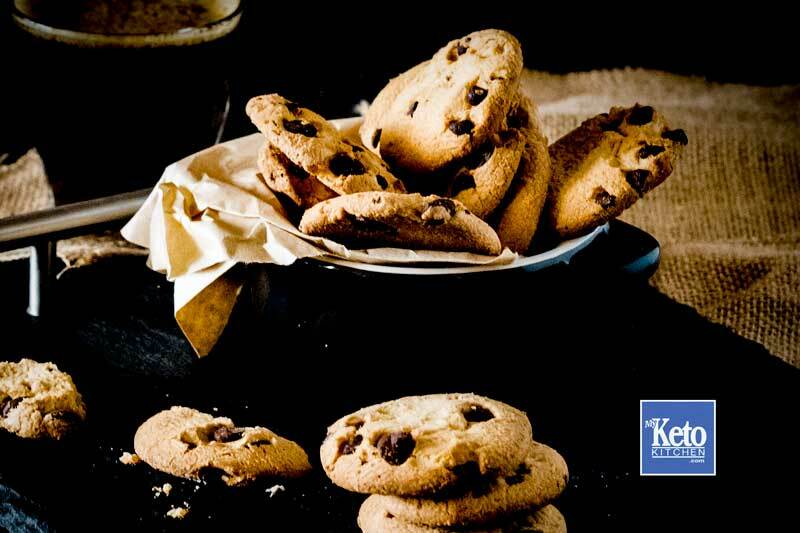 The keto chocolate chip cookies will firm up more as they cool but remain chewy. Keto Chocolate Chip Cookies are Chewy and Gluten Free. 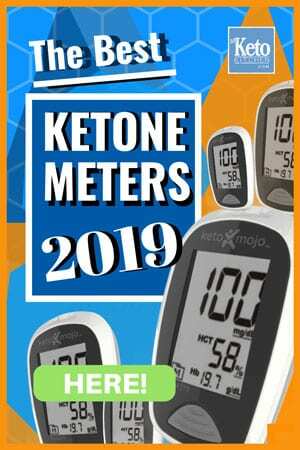 They are a great keto snack to keep in your desk drawer for when hunger strikes. You'll love them. Put all ingredients into your kitchen aid/food mixer and mix all ingredients on a low setting until all ingredients thoroughly mixed. Bake cookies for 14-19 minutes. The cookies are ready when they feel firm around the edges, they will firm up more as they cool. 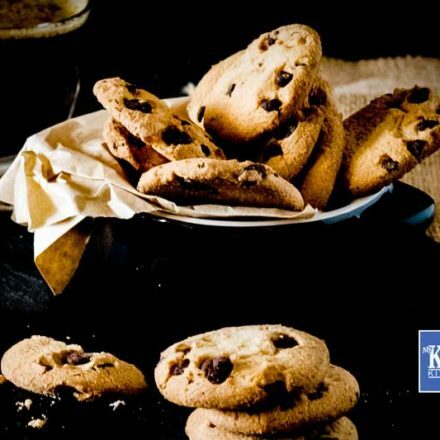 If you want to make a larger batch of this Keto Chocolate Chip Cookies recipe adjust the servings above. Love your recipes!, love to get your newsletter/blog by email.